BentoLunch.net - What's for lunch at our house: A Bento in Our New Yubo Box! A Bento in Our New Yubo Box! So I've been kind of wanting a Yubo Box to play with, but as you all know I technically need more boxes like I need more holes in the head. However, when a good sale popped up, and a friend had an extra first-time buyer at the site coupon, I decided to make the dream a reality. I actually purchased two, but for some reason, they shipped separately, so only Ben's was here for this morning. Of course, he wanted to use it and Faith thought I should wait till they both had their boxes in. And I wanted to play with it, so I won. 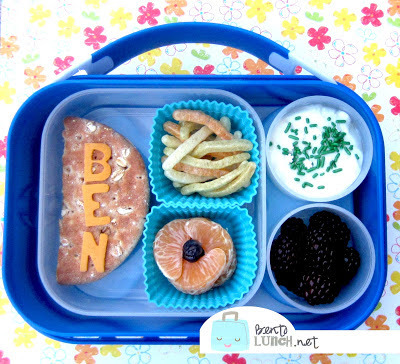 Ben has a cream cheese and cantaloupe jam sandwich on multigrain rounds, topped with his name in cheddar letters. (I was going to go with a theme, but I'm reorganizing kitchen cabinets and the cookie cutter cabinet is blocked with boxes.) He had some cutie orange slices with blueberries in the center, and some veggie straws. What I loved about the Yubo is the separate tight-seal containers to the right hand side. In one, he has vanilla yogurt with sprinkles, and in the other, he has frozen blackberries (which will thaw by lunch). In the back, you can kind of see the built in ice pack which all the containers sit on, so no worries about fitting proper icepacks in containers either! 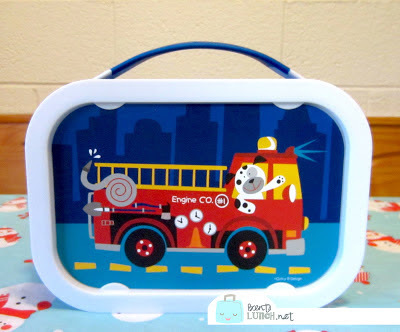 Because they were sale priced, I didn't have an option to choose another pattern, but Ben did like the firedog (he likes dogs). I may look into ordering a few other faceplates for the box, just so he can alternate, since they are interchangeable. That Yubo box is so fun! Great lunch!